The Steamboat Springs High School Marching Band took to the street for the annual winter carnival as usual—but with one difference from their usual parade formation. They were all on skis. It’s hard enough to manage an instrument in a marching band, imagine doing it on skis in sub-freezing temperatures with synchronized kick turns! Bonnie Bogue served as the drum major in the 1950s. Bonnie’s roots are in that small village of 2,000 people in northwestern Colorado where her mother founded Colorado Mountain College. Called “Ski Town USA,” Steamboat Springs was always a venue for Olympic ski jumping and later became a ritzy ski resort. Her small high school at the time had a total enrollment of 175 students—and a concert band with 50 players! Clearly, music was an important aspect of life in Steamboat Springs; even the jocks played. 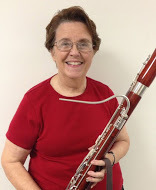 Bonnie, never one to avoid a challenge, has been a bassoon player with the Prometheus Symphony Orchestra since 1966, while conducting a successful law career and raising a son (the first “Prometheus baby” and an occasional trumpet player) who now has kids of his own. She’s the most tenured member of the orchestra. She started as a clarinet and saxophone player and took up the bassoon at age 14, when the bassoon player graduated. She liked the bassoon so much that she went to the University of Colorado, Boulder, as a music major. But foreseeing the slim prospects for supporting herself playing bassoon, she changed majors. Then the problem was that she had no bassoon, having played on bassoons owned by her high school and the university. Bonnie moved to California while her husband was pursuing a PhD, and worked as a secretary on the UC Berkeley Campus. A friend there learned of her bassoon-less plight and volunteered her husband’s bassoon since he wasn’t using it. She gladly accepted, resumed playing, and went to Boalt Hall Law School, figuring she ought to be sensible and pursue a career that could support herself and her son. After working for 30 years as a lawyer with the Institute of Industrial Relations on the Berkeley Campus, she became a labor arbitrator. And she bought her own bassoon.